Dark comedy, twisted teenagers, and murder plots have walked hand-in-hand since the ‘80s, where light jabs and satirical angles try to keep that subject matter from appearing too grim or morbid. For the most part, that heavy attitude still overpowers the doses of humor injected into the film, ranging from the callousness involved with social ostracization an suicide in Heathers to the layering of deceit and importance of popularity in Jawbreaker. It's a lineage that undeniably courses within the veins of Thoroughbreds, Cory Finley's pitch-black glimpse at a pair of near college-aged girls who consider murdering someone who's making one of their lives miserable. Between the deadpan tempo of its humor, sharp outlook on dismantling social conventions, and examination of both the main characters' psyches -- all alongside a riveting percussion-driven score -- Thoroughbreds ends up being a different beast than other like-minded members of the mortal teen-angst clique, perhaps a more meaningful one. Under scrutiny for animal cruelty after crudely euthanizing her ailing horse, Amanda (Olivia Cooke) no longer maintains any friendships in her upper-class Connecticut neighborhood. Once a friend of Amanda's, Lily (Anya Taylor-Joy) gets persuaded to try and hang out with her, under the guise of a study session. Tensions rise between them when Amanda figures out the rationale (and compensation) behind Lily's rejuvenated interest in their friendship. Once the pair lower their guards and start being honest with one another about their personalities and behavioral issues -- Amanda's inability to feel emotions or social discomfort; Lily's obligation to act proper and hide her honest, bitter side -- they start to cut through the problems that truly ail each other. Turns out, between her father's death and her mother's remarriage to a wealthy yet abrasive businessman, Lily's dealing with her own mentally demanding issues, which takes a surprising detour toward considering whether she could pull off a murder. 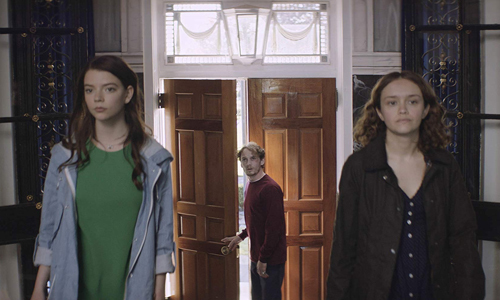 Thoroughbreds functions around Amanda's numbed emotional condition as the driving force behind its conceptual strategies, and a character like that could've easily come across as a deliberate pawn for the plot without a convincing human resonance. Bringing a similarly quiet potency to her performance as she did to Me and Earl and the Dying Girl, Olivia Cooke embodies the uniquely stoic and blunt mannerisms of Amanda with a specific authenticity through her wearied gaze and mildly gravelly voice. As she cuts through social norms while chatting with Lily about the nature of standard test answers, false emotions, and her perception of death and murder, Amanda transcends any appearances of being a plot device and becomes an authentic character worth exploring, and worth one's empathy. While the film might be branded a comedy, the only tried-and-true humor can be gleaned from Cooke's deadpan delivery of the character's unfiltered attitude, which -- much like Lily -- shocks one at first and then simply become an inherent part of her charm. She's a unique, layered persona, and not merely a moving part of the script. Amanda's emotional detachment -- and how it factors into an atmosphere that could lead to murder -- might provide the hook for the plot in Thoroughbreds, but Lily ends up being a more compelling subject for a character study, shaped into a mysterious and thoroughly gray-area entity by Anya Taylor-Joy. While there's unpredictability to how Amanda's disposition will respond to different scenarios, there's also a degree of consistency to her forthrightness and what can be expected from that, something that Lily doesn't share. Her attitude becomes deliberately fluid as she adjusts to her new kinship with Amanda, shedding the false upper-class veneer for the shrewdness and candor that really lies underneath. Much like what Christian Slater's JD accomplishes with Winona Ryder's Veronica in Heathers, Amanda draws out the audacious feelings stirring in Lily … though, as the story methodically reveals, those feelings have been impacting her life for quite some time. Discovering the boundaries that Lily's willing to cross, illustrating the depths of her own mental darkness, becomes absorbing. With the clever, spread-out arrangement of a drum-heavy musical score elevating the mood throughout Lily's family mansion and elsewhere, the suspense mounts in Thoroughbreds once the topic of murder gets breached between the two girls, organically shifting from personality clashes to ethical musings. There isn't any gleefulness to the topic of murder here, as the tension executed by Cory Finley hinges less on how the pair might kill someone and more on whether their moral barometers would allow them to do so. The topic of sociopathy gets introduced early in the story, and a big part of what makes Thoroughbreds an intriguing piece of work comes in deciphering whether either of the girls fit the mold of a sociopath, or whether the circumstances are simply that dire that they're driven to severe choices. Director Finley ensures that there isn't just simplicity to interpreting that, either, underscored by the menacing presence of Lily's step-father and the girls' willingness to seek out a strung-out drug dealer who might be willing to help, creepily embodied by Anton Yelchin in one of his last performances. Whatever resemblance of humor there might've been early on in Thoroughbreds gets stampeded by the heaviness of its later psychological thrills, which hinge on a semi-realistic grasp on the gravity and finality of committing murder instead of glorifying vengeance and/or violence. This is a more fascinating downward spiral for the thematic weight of it all than the logistics of how things occur, in which writer/director Finley relies on the culmination of expressive goals and the austerity of his style -- at one point involving superb usage of distanced sound, long-shot cinematography, and offscreen brutality -- to distract from a few issues with plausibility. What Thoroughbreds has to say about upper-class elitism, coping with grief, and the mental strain placed on teens regardless of their upbringing gallops in step with the suspense, spurring the film's momentum forward without getting preoccupied with forcing clear-cut messages upon those watching. It wouldn't be incorrect to consider this Heathers for a new generation, but with an added cerebral kick that better leads it into modern concerns.